Artist concept of the Block I configuration of NASAÃ¢â‚¬â„¢s Space Launch System (SLS). The SLS Program has completed its critical design review, and the program has concluded that the core stage of the rocket will remain orange along with the Launch Vehicle Stage Adapter, which is the natural color of the insulation that will cover those elements. Oh man, the thing looks infinitely better with the painted tank, just like the shuttle. okan170...SERIOUSLY. The link and all discussed in the previous 3 posts. Completely unnecessary. Apologies, fair enough. Felt a bit of a need to bring it up after it made folks chew me out for merely saying earlier that it was to be orange. Post removed. Actually, technically it's UNpainted Orange is the natural color of the thermal insulation used on the outside of the tanks- by not painting them, they can save a few hundred kilograms of weight. The Shuttle tank was painted white for the first two launches before they realized they didn't need it- looks like they're taking that lesson to heart here as well. Great to see you're still working on this! Gotta start following your sketchfab I guess Any sort of ETA for another release? Not to rush you or anything, just really looking forward to your models! Yeah I'm still working on this. The SLS curse is a rough thing. But hopefully since someone else has actually released a low poly SLS, the SLS curse will leave me alone. So far, I've been hit with a harddrive crash that made me start from scratch. Then I was hospitalized for a while. Then I took a break to level up my modeling and texturing skills (thanks to Digital Tutors/Pluralsight). Now, the models are done. But instead of releasing it now, I'm working on PBR textures for Unity 5. The Diffuse textures used by KSP now has an entirely different workflow than PBR textures. So I chose to only do one set of textures as opposed to doing to set of textures with different workflows. The new Orion render with the reflective shader is amazing. Really shows what kind of stuff will be possible in 1.1. Feel like blogging or journaling any of your development process? I'm not a good blogger, so I have no intention of writing a blog. Especially since I'm in the latter stages of development. FYI. The WIP for the full orion. Capsule, Heatshield, Parachute module, cover. I was browsing through your sketchfab and came across the Explorer Pod Joined. Was this before you decided on the Altair pod? It looks fantastic! Sorry, didn't mean to take so long to answer this. The new forums "activities" are a poor replacement for the old "subscriptions". The one thing that burns me out and discourages me the most about modding for KSP is the apparent disconnect between Unity and KSP. This has been a problem that I've been encountering since I've started modding for KSP. For example, currently I'm doing the parachutes for the Orion. I've been doing the parachutes for the Orion for about a week. Process is like this: Made models in blender. Perfect. Import models into Unity. Perfect. Do Parachute animations in Unity. They work flawlessly. Pump it though PartTools into KSP. Parachutes deploy in the wrong direction. Double check animations in Unity, export. Same result. Look up problem on the forums. Try solutions. No change. Go back into blender, rotate and apply rotation to make the model "Y-up". Correct in Unity, redo animations. Export to KSP. Same problem. Rotate parachute in KSP, redo animations, export. Same problem. So I'm currently redoing the parachute hierarchy and animation for the dozenth or more time. Same problem. Do you think it will get better in 1.1? I'll just leave this here... for some reason. Wow. Looking good. Are you using multiple materials on a single mesh, or is each material it's own mesh? Trying to figure out how to do this myself without causing a bazillion draw calls per part. There are 6 parts in that Sketchfab and 6 textures. The LES, the Aeroshield, orion parachute module, the orion mpcv, the orion heatshield, and the service module. 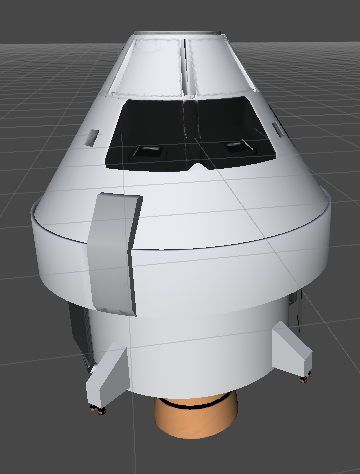 There are four meshes in the parachute module (the base, the cover, and two parachutes [drogue and parachute]). There rest are single meshes. The 1.1 pre-release is out, tried anything? Nope. I bought KSP through the Squad Store, I'm not on steam. Any progress on the sls payloads? Thats fine! Your work is looking better and better, especially what you just posted. Excited to see the SLS in all its glory when you do get it out there. Your recent models look AMAZING! Good job!